We consider the unsteady regimes of an acoustically driven jet that forces a recirculating flow through successive reflections on the walls of a square cavity. The specific questions addressed are whether the system can sustain states of low-dimensional chaos when the acoustic intensity driving the jet is increased, and, if so, what are the pathway to it and the underlying physical mechanisms. We adopt two complementary approaches, both based on data extracted from numerical simulations : (i) We first characterize successive bifurcations through the analysis of leading frequencies. Two successive phases in the evolution of the system are singled out in this way, both leading to potentially chaotic states. The two phases are separated by a drastic simplification of the dynamics that immediately follows the emergence of intermittency. The second phase also features a second intermediate state where the dynamics is simplified due to frequency locking. (ii) Nonlinear time series analysis enables us to reconstruct the attractor of the underlying dynamical system and to calculate its correlation dimension and leading Lyapunov exponent. Both these quantities bring confirmation that the state preceding the dynamic simplification that initiates the second phase is chaotic. Poincaré maps further reveal that this chaotic state in fact results from a dynamic instability of the system between two nonchaotic states respectively observed at slightly lower and slightly higher acoustic forcing. 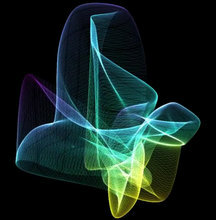 Video showing the construction of an attractor, obtained from the temporal signal $s(t)$ of one of the velocity components at a given point in the cavity. The point follows a trajectory defined by $(s(t), s(t+\tau), s(t+2\tau))$ where $\tau$ is a characteristic time delay of this signal. The color is chosen as a function of the distance to the origin. The signal intensity increases with the number of passes. The reconstruction required the storage of a temporal series $s(t)$ containing 1 million points !